and that the hill road was ". . . nothing less than a long narrow streak of mud winding along the face of the hill." The new improved and modern Hill Road. The time period for the above picture is probably between 1905 and maybe 1915. 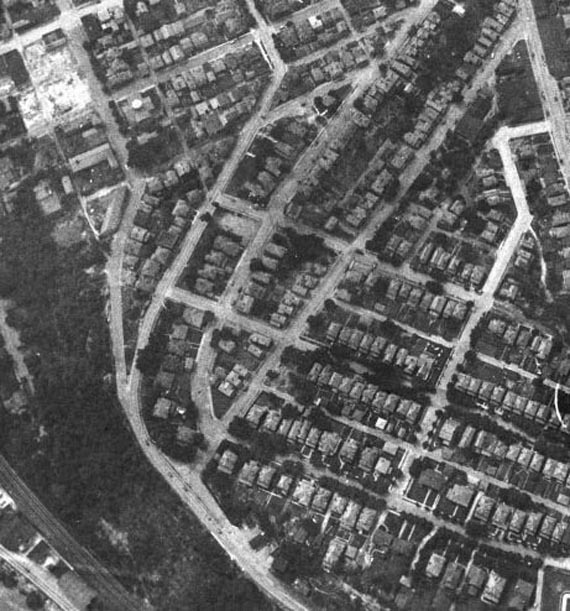 In the above picture you have an aerial view, probably taken in the late 1930's or early 1940's showing East 5th Street coming up the hill from downtown. 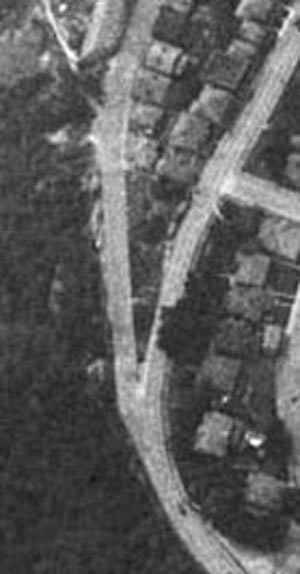 East 5th Street became Pa. Ave. at the bend where the road veered to the right, with Sugar Street joining E 5th from the left. 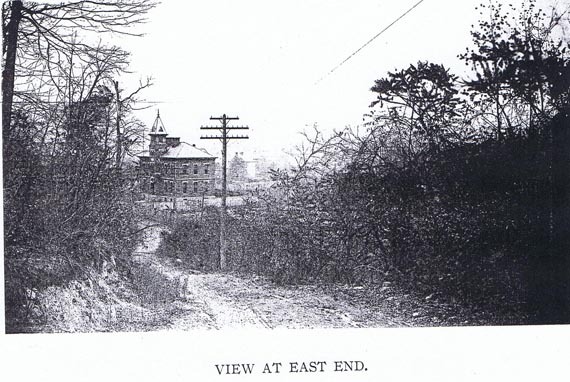 You can also see East 4th Street as it comes up and joins Pa Ave. at the top of that hill. At this point Pa Ave,/Hill Road levels off makes the turn steering the road easterly off towards East End. This area is in the general area of the top of Ravine Street. Notice that the Memorial Auditorium and the Bus Terminal had not been built yet. It appears that there is still a house or building on the corner of E 5th and Walnut where the Bus Terminal would eventually be built and a cleared lot on the corner of Walnut and E 4th Street where the M.A. would be built. 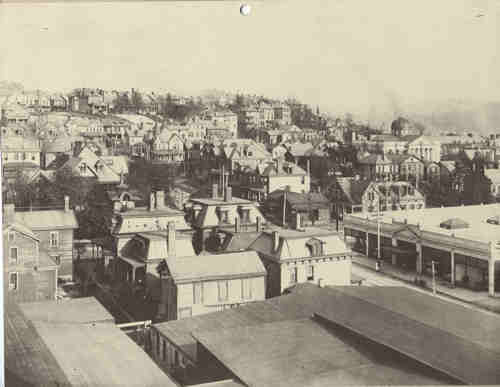 In the above picture the four major streets from left to right are as follows: East 4th Street, East 5th Street/Pa. Ave., Thompson Ave., Ravine Street. As a result of the Chester Bridge being condemned by the State and it being torn down there was pressure to build a new bridge. 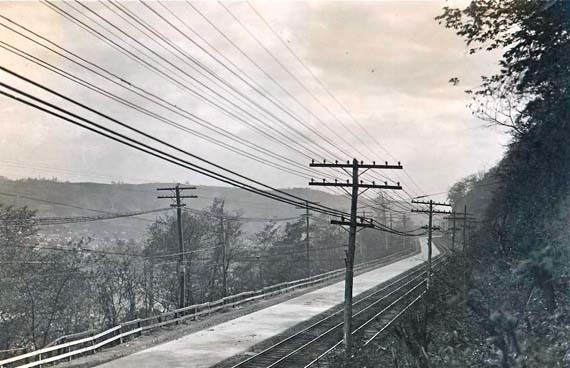 Since the first phase of the Route 11-39/7 was already completed and the plans for the second and third phase to be four lanes and to extend eventually to the Pa-Ohio State line the plans for the new bridge would require it to fit in those plans. The old Hill Road would be closed so that construction could begin on the new four lane from downtown to the Mulberry area of East End. 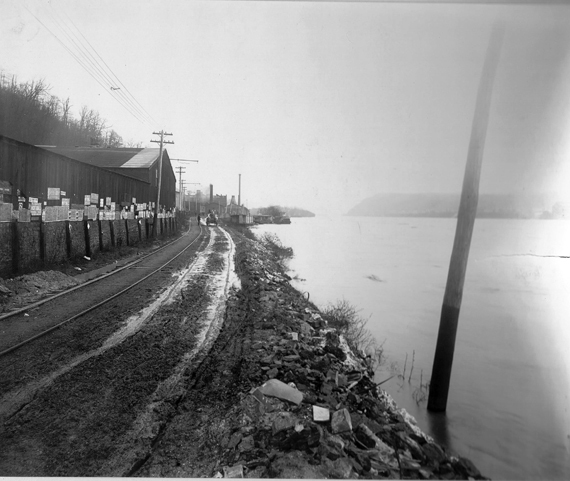 The River Road along with St George Street and Mulberry Street would become the detour route. The Hill Road was closed to all traffic for good in the mid 1970's. Looking back towards the downtown area. Northeast corner of Vine Street and Pa. Ave.
Northwest corner of Vine Street and Pa. Ave. 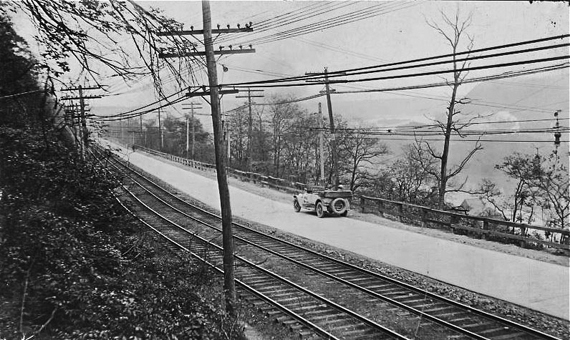 This and the next picture offer a view as the old Pa. Ave. approaches the bend that would run it along the face of the hill towards East End. 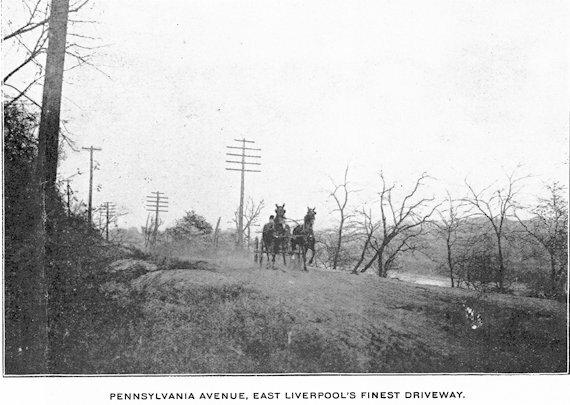 To the right center of the picture you can see what is left of the brick roadway of the former East 4th street as it came up the hill to merge with the Pa Ave, (Old Hill Road). 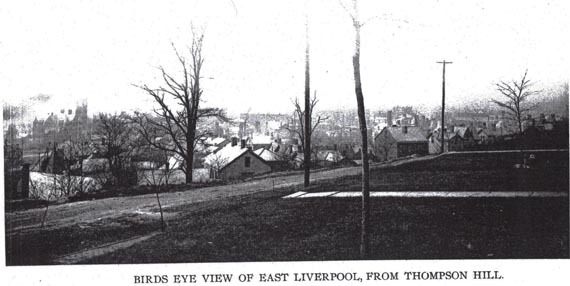 This picture offers a more compact focused view how East 4th Street merged with Pa. Ave.